Time for another upgrade to our MakerBot Replicator 2 3D printer, this time we have decided to replace the extruder nozzle. This upgrade we did more out of curiosity than because we actually needed to – no jammed nozzle or problems with the original one aside from the fact that it did not look that good anymore. As you can see on the photo above the original nozzle on the left does not look so good anymore due to the stuck PLA filament on it that we have removed, but some stains were left. 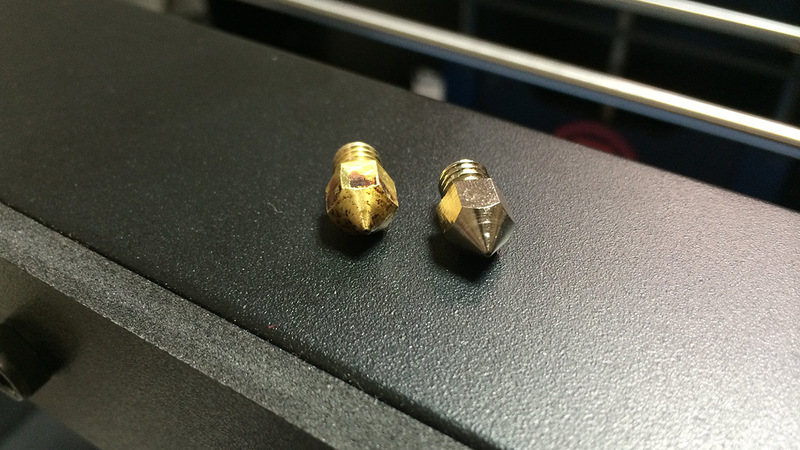 The extruder nozzle on the right is the Low Friction MK8 Extruder Nozzles from Performance 3-d. The extruder nozzle upgrade we are installing is also made from brass base material like the original MakerBot one and has the same parameters. The difference however is the special coating applied that makes all of the difference when printing as it can help in preventing a lot of problems while extruding material due to the fact that the filament does not stick so easy to the nozzle. Other than keeping a cleaner look and fewer problems with printing and filament sticking to the nozzle we are not seeing difference in the quality of the prints, not that we actually expected to see some anyway. It is all about having less problems like filament jams, or when using abrasive filaments like carbon fiber wearing off the nozzle and the Low Friction MK8 Extruder Nozzles from Performance 3-d seem to do very well in these areas. What we want to share with you is that the replacement of the extruder nozzle is something that is not very easy to do as it requires disassembling most of the extruder in order to be able to safely remove the old nozzle and replace it with the new one without the risk of damaging something. We would recommend to only replace the extruder nozzle only if you have no other choice and not just out of curiosity or if you want to test something out. With that said however it will be a wise idea to have a spare extruder nozzle available ahead of the time when you might need to replace the stock one.